The financial services industry is one of the largest export sectors in the UK, employing over one million people in Britain. Tailored towards students from a financial services background, we equip you to succeed in an international finance career. Why study BA Financial Services (Top-up) at Middlesex University? Our one-year advanced entry course, taught from our London campus, places you at the centre of the capital's global economy. You will graduate, armed with advanced financial knowledge and skills and primed to meet the emerging needs of the global financial services profession, which includes banks, building societies, general insurance, life insurance, securities trading and investment management. Alongside learning to apply analytical and quantitative techniques to a range of fiscal subject areas, you will extend your understanding of the theory and application of economics in finance. 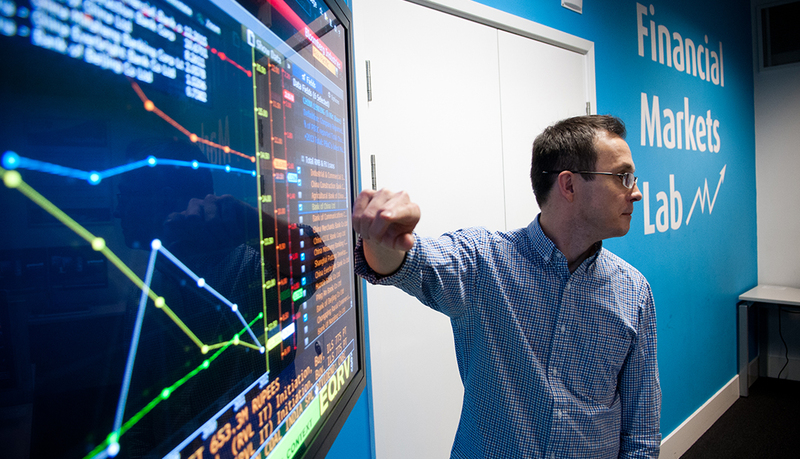 In the Financial Markets Lab students also get the chance to work with Bloomberg and Datastream finance software. This degree is tailored towards HND Financial Services graduates and offers direct entry to third year/level 6 qualifications. What will you study on the BA Financial Services (Top-up)? Building on your financial services background, you will gain a thorough knowledge of finance theory and policy; international monetary theory and policy and the operations of modern financial institutions including services, products, risks, and markets. Through studying the course core modules you will explore the issues involved in delivering financial services in a real-world context, examining regulatory and ethical issues. You will also develop an understanding of the theory and practice of financial data analysis and the marketing approaches employed in the sector. Further modules will train you in the marketing function of financial services, and quantitative and computing methods applicable to fiscal sectors. You will develop a suite of transferable skills including the analytical, numerical (finding and evaluating information) and information technology skills required for financial services professionals. Alongside this you will learn to write effectively for business and communicate more proficiently in both written and spoken form. This module aims to further develop and enhance your financial understanding and knowledge within business organisations. It aims to provide a more in-depth understanding of the roles of accounting and finance for those who do not need to develop specialist knowledge and to train you to apply your accounting and finance skills into a range of different business situations. This module aims to build your knowledge of banking as preparation for further study. It approaches banking from an economic perspective with an aim to explore the complexity and integrated nature of financial systems, identify and assess different systems of allocating funds for economic development, and develop your ability to apply introductory risk management tools and techniques in banking. You will also investigate emerging issues and contemporary trends in banking theory and practice. The module aims to develop your knowledge of contemporary international financial markets through an examination of institutions, functions, products, services and participants. Together with coverage of security valuation techniques, the impact of financial liberalisation, the globalisation of capital flows and the implications of the international banking crisis that began in 2008, the module aims to provide you with the knowledge needed to interpret and contextualise the actions of corporations, public bodies, investors and service providers in financial markets. The module also aims to provide insight into how technological innovation has affected financial markets, especially in relation to the analysis of risk, the evolution of asset management practices, the development of financial products and the emergence of novel trading systems. Work experience is one of the most valuable assets you can have in planning a successful career and you are encouraged to gain a placement or internship if you can. Work placements are supported across the University by the Employability and Careers Centre. The work placement modules can be taken between April and September of the first academic year. This module primarily aims to provide you with the technical and theoretical knowledge necessary to understand the international financial system. The first half of the module introduces the different components of the financial services sector, and the specific roles they play. The second half of the module takes us into the operation of financial markets and the application of financial instruments and techniques used in managing the financial assets and risks. Global financial and banking crises will be examined, with special emphasis on emerging markets. The role of international financial regulation, viz., the Basel Capital Accords, will be examined from the perspective of mature economies and emerging markets. This module explores the impact of national and international regulatory and market experiences that impact financial services marketing. Drawing on the theoretical frameworks and practical applications of both marketing and the business of financial services, the module enables you to identify, critically evaluate and apply relevant knowledge and derive viable solutions to complex real life situations that currently impact the marketing of financial services. You will be introduced to a wide range of analytical, managerial and theoretical techniques and concepts which experts in the field believe to be relevant and useful for financial services marketing. You will also be introduced to new developments in the field including issues surrounding the ethics, professional practice and industry standards that affect financial marketing. You will be encouraged to evaluate critically the techniques, concepts and applicability to national and international financial services contexts. This module aims to enhance your knowledge and understanding of financial data analysis techniques used in the financial services. 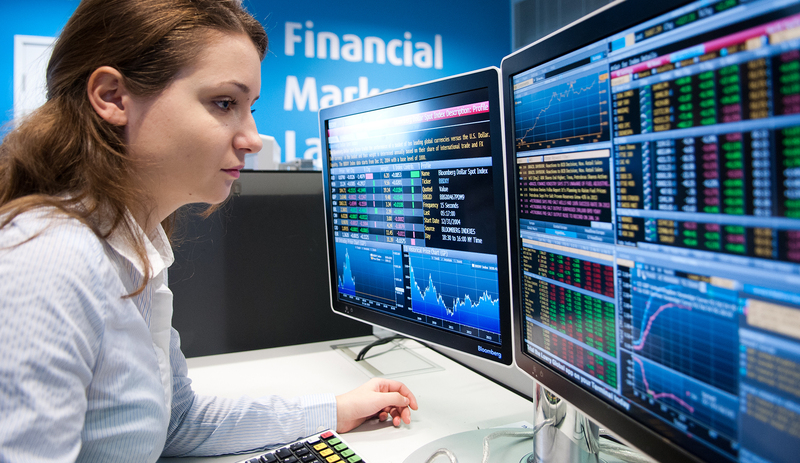 The module uses mathematical and statistical techniques to develop an understanding of the models underlying finance, and statistical and probability methods used in analysing financial data. Throughout the module, computer packages are used to develop a deeper understanding of the techniques. This module aims to provide level 6 students with the theories of exchange rate and balance of payments, and skills of managing international financial assets and exchange rate risks in a global environment. You will have the opportunity to study the operations of the world capital markets, grasp the principles essential to understanding of global financial issues and policies, and apply tools to effectively evaluate international risk in order to succeed in international financial environment. The module aims to develop your knowledge of modern investment theory and practice. A detailed study of classic portfolio theory provides the basis for an appreciation of, and further investigation into, themes that are currently at the forefront of reflection and research in investment theory, including sceptical views of the classic paradigm whose status has been boosted by the international banking crisis that began in 2008. In tandem with a critical approach to theory, the module offers insights into the quantitative methods (and supporting technology) that are used to inform the construction and management of investment portfolios. Furthermore, you will analyse institutional, product and technological innovation in the sphere of investment management, particularly in relation to a heightened concern with risk control, market liquidity and disclosure of information. How is the BA Financial Services (Top-up) taught? You will gain knowledge and understanding through guided reading of textbooks, academic journals, computer aided packages, on-line and in-class tests, seminar exercises, workshops and lectures. We encourage our students to undertake a paid work placement during their studies; either as a year long assignment between year two and three, or as two shorter placements during the summers of your 1st and 2nd years of study. As an alternative to a year-long placement, you can instead undertake an internship as part of your course; either full-time over the summer following your second year of study, or part-time throughout the course of your final year. Work experience in the form of placements and internships greatly improve graduate employment prospects, and students who take part tend to achieve excellent academic results through applying their learning in a professional setting. Our specialist Employability Service and London location ensure that every year our students and graduates gain prestigious placement opportunities. Your knowledge and understanding is assessed through informal tutor feedback in seminars and workshops and by on-line and in-class tests. Summative assessment is by tests, written coursework and seen/unseen examination. 120 UG credits at Level 4 for Year 2 entry or 240 UG credits for Year 3 entry. Students with other HND or equivalent qualifications will be considered for admission, provided that they have a minimum of 15 credits in Economics. Please apply via UCAS using this course’s UCAS code N301. How can the BA Financial Services support your career? You will graduate with a firm foundation for professional employment within the international finance sector and well prepared for postgraduate study. You can also go on to further study on courses such as MSc International Banking & Development, MSc Banking & Finance, and MSc Technology & Innovation Management. Our Employability Service can help you to develop your employability skills and gain valuable work experience. We provide workshops, events and one-to-one support with job hunting, CVs, covering letters, interviews and networking. We also support you in securing part-time work, placements, internships, and volunteering opportunities, and offer an enterprise support service for those looking to start their own business. Dr Badreddine's research work, which focuses on understanding stock markets and how their movements underpin and drive our economies, is critical for policy makers and business leaders alike. Through the investigation of persisting anomalies in stock markets and investigating the sources for the consequent abnormal returns, he examines whether the behaviour of certain stock reflects earlier anticipation. Dr Bace has spent a long career in finance and banking in New York and London. He has worked for Standard & Poor's, Lehman Brothers and EBRD, among others. Now he specialises in transmitting his experience and expertise in credit, commercial and investment banking in educational settings. He is a frequent speaker and participant in international conferences, is involved as a journal editor, is a CFA and a Charter Member of the Chartered Institute for Securities & Investment. He has served on the global Ethics Committee of the Professional Risk Managers' International Association, of which he is also a member, and is on the Board of Trustees of the Council for British Archaeology.